As it's been well documented on this blog for nearly three years, horror films are probably my least favourite genre. Being scared for the sake of it just isn't my idea of entertainment. However now and again you get a gem of a film full of atmosphere, frights but also (heaven forbid) a good cast with good acting and a mildly interesting plot. With Nick Murphy's The Awakening, we just about get all of this. Starring the wonderful Rebecca Hall the film tells the tale of young ghost hunter, come writer, Florence Cathcart. After a series of debunking the world of the paranormal in a very Miss Marple/Sherlock Holmes fashion, her journey leads her to an inevitably creepy and isolated boarding school which unearths something ghostly and reveals more secrets than the woman is ever willing to admit about her past. It very much conjures memories of the brilliant Spanish horror film, The Orphanage. Personally Rebecca Hall's Florence Cathcart was a delightful character to see develop on screen. If the BBC (who co-produced the film) wanted to create a new female equivalent of Sherlock Holmes I honestly believe this blunt, over analysing, flawed, intelligent protagonist could work so amazingly well in her own TV series in similar situations. This almost primal need to seek out the truth of the unknown, all the while secretly wanting for it all to be real. Though her backstory turns into a bit of an inconsistent muddle towards the end overall it was truly enjoyable experience - if not the most terrifying one I've ever witnessed. The Wire's Dominic West was his usual best and provided the perfect companion to Hall's quest, while also dealing with his own psychological ghosts from The Great War. Again not surprising given her own pedigree, Imelda Staunton channelled her brilliance from Mike Leigh and Harry Potter films past with an elusive, strange and at times mentally disturbed performance as the mysterious maid of the house. Visually from beginning to end it almost felt like Tim Burton got his hands on Downton Abbey for one week and decided to run riot with it - especially in the opening scene involving a seance. Nick Murphy and his crew did a brilliant job of taking the tired, albeit tried and tested, haunted house routine and gave it some urgency and an interesting psychological edge. Unfortunately for the abundance of atmosphere the film contained it sorely lacked, for the most part, any genuine scares. So anybody looking for a repeat of their Halloween ventures to the cinema of Paranormal Activity 3 might be in for a disappointment. In the hands of lesser acting talent or creative team The Awakening could have easily been a torrid unmemorable affair. Nevertheless Rebecca Hall gives an exciting performance with a character she could easily make her own if Nick Murphy ever decided to develop her adventures further. If you can forgive the muddled ending and somewhat convoluted twist, the film itself is a fun night out at the cinema for people, like me, who just want a good movie instead of a good scare. 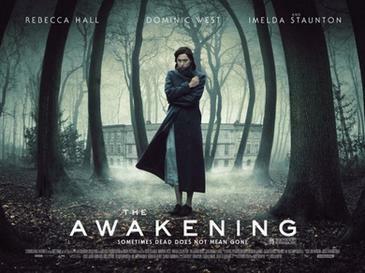 The Awakening is in selected cinemas throughout the UK from November 11th 2011.